I needed something different for a narrow and tall tree. I love the Upright Cross Stitch for a tree, so I just put it on a diet. The stitched sample uses six plies of DMC Cotton Floss and a cute pearl from SJ Designs on 13-mesh. The open intersection is 2X2 rows. 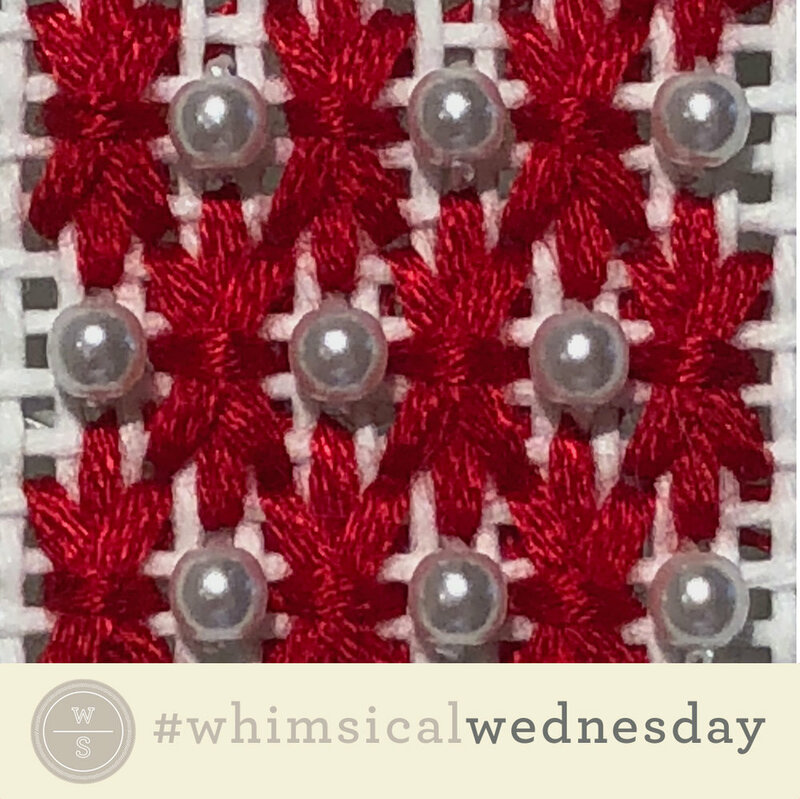 If a large embellishment isn't the right thing for your space, consider a size 11 bead over two rows, four French Knots, four beads, an Upright Cross, or even a Smryna Cross. If you would like less texture, consider four tent stitches, a 2X2 Mosaic stitch, or leaving it open. In case you haven't figured it out yet, I love Lorikeet for greenery. In my opinion, mixing Lorikeet with a solid color thread is always a good look. Consider Lorikeet for the gray lines and Glisten or Planet Earth Silk Opal for the accent stitch. This would make really pretty clothing with silk floss, such as Soie D'Alger or Waterlilies, combined with beads or a bright metallic. Flip it 90 degrees and I think you have a wonderful water stitch. For that, I would use a lightweight metallic and a bead, such as Kreinik size 8 and a size 11 bead (on 13-mesh) or Kreinik size 4 and a size 14/15 bead (on 18-mesh).